I'm a huge N64 enthusiast, and this is a side project I've done out of my love for the platform. Because of real life I probably can't answer emails immediately but I try to check up every 2-3 days. Please email only the below address for correspondence about 64drive. There is currently a decent-sized backlog of orders. Due to several things like parts availability, real-life obligations and UltraHDMI ramping up, I've not been able to ship many orders or respond to emails the way they should be taken care of. You must have at least firmware 2.00 to apply these upgrades. Click on "Legacy Downloads" below to find out how to upgrade if you have firmware 1.00-1.05. 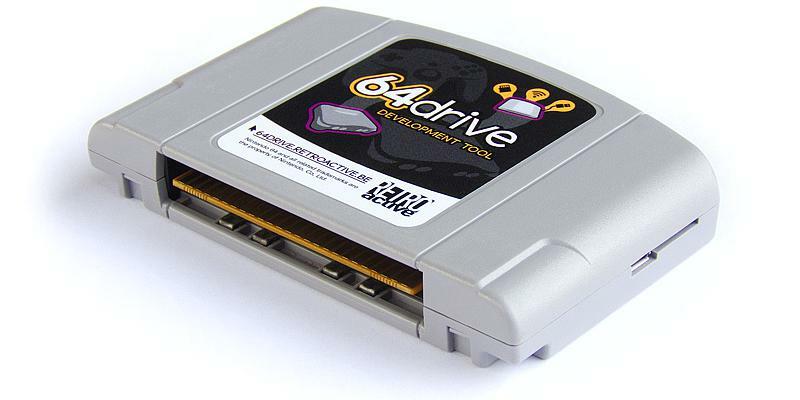 64drive HW1 models produced before about July 2013 are eligible for a free label upgrade. Design based on TEMPLATED source "Nintendo" is a registered trademark of Nintendo of America Inc. Nintendo 64 is a registered trademark of Nintendo Company, Limited. Disclaimer: This page is for informational use only. The user of this device assumes full responsibility ensuring its use in accordance with local and federal laws. The software and hardware on this site is provided "as-is", without any express or implied warranty or guarantee.